‘SOMEWHERE IN THE MIDDLE OF 1989,’ Peter Era told me, ‘we watched from Onove as the PNG army torched Kavarongnau village. ‘Two days later, they again torched the next village of Tonanau when the people were busy preparing for a feast which they then left and fled and the army helped themselves with those pigs and food’. Anger about these inhuman activities of a so called professionally trained army of country led Peter Era, then 19 years old, and other men form the villages to set an ambush for the Bougainville Copper Limited (BCL) convoys employed by the PNG Defence Force. MONDAY 29 APRIL: GOODBYE DUBAI. Our last voyage on board MV Nautica, which we embarked late this morning, was in May-June 2011 when we transited from Athens through the Dardanelles and Bosphorus and around the Black Sea ports to Istanbul. This time it’s a longer journey which touches upon Muscat, Jordan, Egypt, Israel and the Greek isles, ending up in Italy about three weeks from now. LANDOWNERS OF THE PANGUNA copper and gold mine in Central Bougainville have reaffirmed their stand that they want the mine reopened. The assurance was delivered by an executive member of the United Panguna Mine-Affected Landowners Association (UPMALA) during the Third Regional Forum on Panguna Negotiations held in Buin. UPMALA is an umbrella organisation made up of the nine landowner associations from the mine’s affected communities. SATURDAY 27 APRIL – DUBAI. “Ask me any question,” invites our guide, Barti Rajan. “Any question.” This time with emphasis. Indeed people flock to Dubai to shop, inspired by the knowledge there are no taxes on gold and other traditional tradables like spices and fabrics. I AM NOT A PROFESSIONAL WRITER but every now and then I jot down my thoughts and opinions of things I am passionate about. I love expressive arts. I absolutely love politics - Australian and Papua New Guinean. I don’t care too much about becoming a politician but would love to be a political correspondent or critic. My experience in New Zealand has taught me a lot about being a Papua New Guinean and our socio-economic and political standing in the world. The greatest lesson being: we are not an island nation. We are the rest of the world. The Poet’s voice has been silenced. There is only an after echo of fading thought. It is the snuffing of candlelight at the market table. It is their Priests who offer you the wine of forgetfulness. It is their Priests who dictate your customary offerings. IN A REMOTE CORNER of Papua New Guinea, the scholar known internationally as the "British Indiana Jones" is tracking a global phenomenon of tribal people identifying themselves as a Lost Tribe of Israel. Florida International University religious studies professor Tudor Parfitt recently conducted a research expedition to Papua New Guinea, where he studies the Gogodala, a tribe of former cannibals who believe they are one the Lost Tribes. The Gogodala are hunter-gatherers in western PNG with very little connection to the outside world. But from the very first encounters with western explorers in the 17th century, the idea took root that ancient Israelite communities were to be found in the islands of the Pacific. Later, Australian missionaries further propagated the idea. FRIDAY 26 APRIL: DUBAI. Over a 10-year period until the Global Financial Crisis, the emirate of Dubai (population about two million) built its prosperity on one foundation in these shifting desert sands – property. And look at that property – soaring buildings of breath-taking splendour, grandiose dimension and boasting a uniquely Arab architecture. But those investors and speculators got burned very badly when the world’s finances took a hammering in 2008. Dubai had to be bailed out from catastrophic debt by the adjacent oil-rich emirate of Abu Dhabi and is now seeking to re-invent itself as a top global city – a would-be tourism and financial mecca. THE REGIONAL MEMBER OF PARLIAMENT for Papua New Guinea’s autonomous province of Bougainville says his people must take ownership of decision making in their province in order for there to be unity. Joseph Lera says Bougainville society remains fragmented well over a decade since the civil war wound up. His comment comes as Bougainville Copper Ltd looks to reopen the Panguna copper and gold mine which was at the centre of the civil war and has lain idle for 24 years. LAST WEEK The National – one of Papua New Guinea’s major newspapers – featured a full page advertisement attacking the AusAID-funded legal adviser to Bougainville, Anthony Regan, who is also a fellow at the Australian National University. 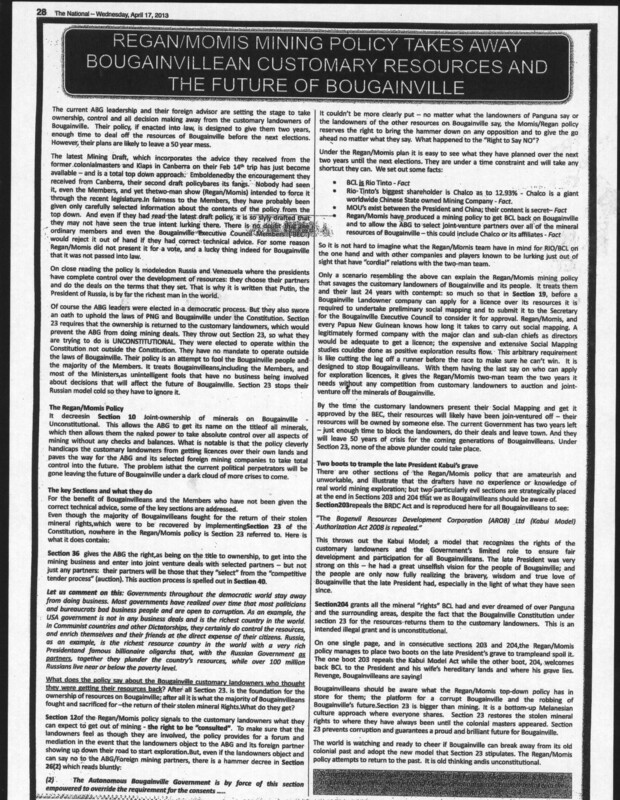 Written by two former Autonomous Bougainville Government (ABG) ministers the full page spread claims that Regan, along with ABG President, John Momis, have engineered a “top-down [mining] policy” that will “take ownership, control and all decision making away from the customary landowners of Bougainville”. ANZAC DAY: SYDNEY-DUBAI. Ingrid and I have been keenly anticipating this trip overseas for many months. It’s been a tough gig this past year: the death of my father; business concerns (which eventually turned out OK with the establishment of Jackson PR); three engagements with surgeons which knocked me around a bit; as well as other life exigencies which, as they can, broke the wrong way. Still a bloke shouldn’t complain too much. He’s alive and will be able to kick again as soon as the latest bit of surgery heals. And I’m travelling to new lands (clarification - the lands are old but new to me). Ah, travel - one of life’s redeeming pleasures. RECENTLY I WENT UP TO WISAI in South Bougainville with a friend of mind to spend time there and see the place. The people are very welcoming even though they are in a situation of conflict - tribesmen and factions fighting each other over the years. Seeing the fields of rice grown there, I remember what life was like during the Bougainville crisis in terms of the food situation. Around 1995 and 1996, as a kid, we were in still in the hideouts of Koromira in east-central Bougainville. PNG's Pacific leadership: Is Fiji the start? PRIME MINISTER PETER O'NEILL is acutely aware of the need to improve Papua New Guinea's international reputation. Part of his plan to do this is to step up PNG's activities as a regional leader, as he explained during an interview at the Lowy Institute in November 2012. This may explain his decision to extend K50 million in assistance to the Fiji government for its elections in 2014. THE ANZAC DAWN SERVICE hosted by Ok Tedi Mining Limited (OTML) in Tabubil yesterday was a reminder and appreciation of the sacrifice made that day. The service was attended by 140 people including representatives of the Australian High Commission, visiting teachers and students from Scots College in Sydney and members of the Tabubil community and neighbouring mine area villages. The service began with the Lord’s Prayer and reading of a poem followed by an Anzac dedication by Australian High Commission representative Tony O’Dowd and an ex-servicemen’s dedication by Cameron McGregor. THIS IS A COMPELLING and informative work. It’s also long overdue – telling the historically significant and often harrowing story of the contribution of Chinese people to the growth and prosperity of what, sadly, we must now regard as ‘old Rabaul’. One detects that this has been a labour of love for Dr Peter Cahill - the son of a polismasta - who lived in Rabaul as a schoolboy. Chinese in Rabaul is written with an admirable blend of academic precision, readable prose and a sense of great admiration and respect for the Chinese people of Papua New Guinea’s Gazelle Peninsula. I WAS SURPRISED TO READ in Jeff Febi’s recent article that the tradition of older, wealthier men having more than one wife lives on. But sometimes love can triumph even over the fear of sorcery as I found in 1970 when I was a kiap at Baimuru. The Village Constable from Uraru, which is located on the upper reaches of the Purari River, arrived at the station clutching an object wrapped in a sheet. The Village Constable told us he wished to report the murder of a villager, an man of over 50 years of age called Momei. SIX STUDENTS AND TWO STAFF members from The Scots College, Sydney, visiting schools in and around Tabubil in the Western Province, yesterday joined the local community in a commemorative Anzac Day service as part of a five-day trip hosted by Ok Tedi Mining Limited (OTML). The trip follows the establishment of the first secondary school in Tabubil (Year 12) in February by OTML and its major shareholder, the PNG Sustainable Development Program Limited. “OTML is committed to creating opportunities for young Papua New Guineans and we believe that grassroots education and cross-cultural awareness are critical keys to any country’s long-term prosperity,” said Nigel Parker, managing director and CEO of OTML. Statues of long lost lovers, on a shimmering street of Arawa. Why the Kavarongnau boy loved her. NEW TO THE SEAGULL flying boats, I first took a couple of local flights around the Port Moresby area. These included the hairy experience of flying Commander Hunt, who headed a small naval surveying detachment, delivering some mail to Yule Island at low level over offshore reefs in a strong south-easterly, when the Seagull appeared to be going as fast sideways as forward. Then my CO, ‘Alex’ Alexander, asked if I would like to take the Seagull down to Samarai. I jumped at this, and with a Sergeant Navigator, Wireless Operator and Engineer Fitter we had an enjoyable straight and level flight on a beautiful day, perhaps three hours at 90 knots, along the coast to Samarai. AS WE CELEBRATE ANZAC DAY, Australians are prompted to reflect on our national character. Drawing on events far from our shores close to a century ago, we lay claim to a particular combination of traits: mateship, pulling together, and brave sacrifice. Anzac Day should also prompt us to look at those actions closer to home that help define us as good mates, ready to pull together for a common cause. I'm talking about the importance of our relationship with Papua New Guinea – Australia's closest neighbour. TOMORROW AUSTRALIANS CELEBRATE ANZAC DAY. A day to pay tribute and remember those who have fought for the Australian nation. Anzac Day is also a time to recognise those who have fought alongside Australians, as allies and, critically important to the outcome of World War II, were our nearest allies - the people of Papua New Guinea. Their guts and bravery helped halt the Japanese Imperial Force from climbing the final hurdle to invading Australia, and their local communities helped convey hundreds of wounded soldiers across some of the toughest terrain in the world, with significant loss of civilian lives. IN SEPTEMBER 1939, HAVING GRADUATED from Point Cook in Victoria in June 1938, I was a Flying Officer in No 3 (Army Cooperation) Squadron at Royal Australian Air Force (RAAF) Station Richmond NSW, doing my tour as Adjutant. I was in the officer's mess with other colleagues when the mess president came in. He was a Wing Commander, perhaps in his early forties. The RAAF was more formal in those days and we all stood for him. It turned out the occasion was to hear Australian prime minister Robert Menzies “melancholy duty” announcement on the wireless that Australia was at war with Germany. Next morning I was told to go to Station Headquarters and report to a Flight Lieutenant Alexander, then on the staff of the station commander, Group Captain Hipolyte Ferdinand de la Rue. IT IS MY CONVICTION that although Australia was an exceptionally good and generous foster-parent to both territories, Papua and New Guinea, it cared for until 1975, it committed two major sins of omission. These were sins of short-sightedness which led to continuing and far-reaching consequences. I have written about the first of my concerns here on PNG Attitude, and fellow PNG-pundits of the aged, expat sort have either shot it down or patted it on the head with faint praise. This plan for the reversal of the first major sin of Australia has been humbly (yes, humbly for once) lodged with people who may take it seriously and even use some strands to weave their own tapestry for tomorrow. Or not, of course. But Harry Topham’s well-put article on Nauru prompts me to propound my second concern. ON 14 SEPTEMBER 2012, the blog New Dawn on Bougainville reported a story entitled Situation tense in Bana after a person was killed in the Jaba area of Panguna as a result of a conflict that started some three months earlier. The conflict was a land related issue at the former Bougainville Copper Limited’s farm site at Mananau, purchased and settled by the Nagovis mountain people of Damane in the hinterland of the Bana district. The crisis and death of the late Kakaleu was over a piece of land that over time had passed through a number of hands. Thus, as we know of oral history, it had been subjected to ‘addition and subtraction’ over time. In my observation, both the killers and the killed were victims of an issue that went wrong somewhere down history lane, affecting a generation that adopted wrong stories and wrong land boundaries. I WAS MY MOTHER’S ONLY CHILD when Papua New Guinea became an independent nation. The PNG flag was raised for the first time and the Australian flag was lowered for the last time. That was 16 September 1975. As the years passed, I enrolled to commence my primary education. That was in the 1980s at the Alkena Lutheran Primary School. Every morning we would assemble, sing the national anthem, raise the flag and shout the national pledge. I did not understand why we had to do that. ROWENA MCNALLY WAS MOVING on from a successful career as a lawyer, including a term as Queensland Sugar Industry Commissioner, when she asked God in prayer if He had any work for her. The answer was not long in coming. Starting 2005, her roles within Church organisations would soon include director of Professional Standards for the Catholic Church in Queensland as well as trustee of Mary Aikenhead Ministries. In the former role, she confronted the dark side of Church history meeting with victims and perpetrators of sexual abuse. By 2012, she was also chair of Catholic Health Australia. As a young girl in Papua New Guinea, Rowena's initial response to Church life gave little indication of the intense engagement to come. MANY OF THE WORLD'S LANGUAGES, including a number in Papua New Guinea, are disappearing and David Chiang wants to do something about it. Chiang is an assistant professor at the University of Southern California Information Sciences Institute and he is worried that the loss of these languages will lead to a diminution of scientific knowledge and cultural understanding. That’s why he spent two weeks in May last year leading a language preservation workshop to save endangered languages in PNG, which has a rich cultural and linguistic diversity. PNG has arguably the highest language density and diversity on earth — over 800 different languages, or a new language for every 215 square miles. THERE ARE MANY FACTORS that contribute to the failure or lack of development of small to medium sized businesses by Papua New Guineans and wantokism is one of them. Wantokism or the wantok system is a phenomenon that impacts upon every sphere of life in Papua New Guinean society, including business. In traditional PNG society, wantokism operated as a welfare buffer and underpinned social security. It ensured no one went hungry or was naked or homeless. Everyone made sure that all other people, including those who were vulnerable and disadvantaged, had food to eat, clothes to wear and shelter or a place to live. ACCORDING TO CARDINAL NEWMAN “it is almost a definition of a gentleman to say that he is one who never inflicts pain.” If this is so, Don Bosgard more than fitted the bill. It was my privilege to have known Donald Gordon Bosgard over a number of years in the Sepik District and after he retired to Sydney. To say that he was of the old school would be an understatement. A dignified and refined man, always impeccably dressed and softly spoken in a clipped Anglo-Australian accent. A BRISBANE SCIENTIST is preparing to begin field trials in Papua New Guinea of an invention expected to get life-saving vaccines to children around the world immeasurably cheaper and years faster than is currently possible. And it's all without the use of needles. Professor Mark Kendall is the inventor of the Nanopatch, a strip smaller than a postage stamp that has thousands of microscopic points which can inject disease-busting vaccines into the skin. For nine years, Professor Kendall and a team of international researchers have been working on the "needle-less" vaccination in the laboratory. TIM COSTELLO, CEO of World Vision, is calling for more young Australians to visit Papua New Guinea and become friends with the Melanesian people, to take time to get to know them and for an effort to be made to understand each other’s culture, dreams and aspirations. One young Aussie who did just this back in 1952 was Bill Wilson (pictured) from Perth, Western Australia, then aged 24. Bill ended up teaching at Keravat High School in the Gazelle peninsula for a couple of years. Here is his story. I TURNED ANOTHER YEAR OLD the other day. But I really stopped celebrating birthdays after 16. I wanted to stay there forever. Sometimes I think I still am. Anyway, birthdays are a time where I'm reminded of how precious life is (not that I forget on ordinary days): to know and be known by the Maker of the Universe; to love and be loved by an incredible woman; to belong to an awesome family; and to dwell in the sweetest country. Such is my lot. What does it mean to be Papua New Guinean? We were deliberately placed here by God. He didn't randomly chuck us here. Or throw us into the air and see where we'd land on Earth. He deliberately decided I'd be Papua New Guinean. DURING THE HEIGHT of the Bougainville conflict, when Bougainvillean boats reached shore safely in Western or Choiseul in Solomon Islands, villagers rushed to welcome our people with food, tears and request for stories of the latest happenings on their big island. I wrote this piece to reflect some of these moments and their chit-chats. PAPUA NEW GUINEA’s staunchly anti-colonial Oro Province governor has accused the United Nations of lying about the extent of gender inequality in the Pacific region. Gary Juffa made the statements during the Pacific Parliamentary and Political Leaders Forum, happening this weekend in Wellington. “The academic brigades from the UN who are coming forward, are consistently and constantly telling us we’re all thugs, living in caves, beating our women, forcing them to cook and do the laundry,” Juffa told delegates in a passionate speech. Arguably 6 November 1953 was the blackest moment in the history of Kiaps in Papua New Guinea. BILL BROWN recounts the details of the day when two patrol officers and two policemen were murdered, and its controversial aftermath…. PHIL FITZPATRICK’S RECENT PNG Attitude article Days of the Kiap – The Savage Murders of Telefomin is heady stuff and a splendid narrative of those terrible events, but some of the assertions wander away from the facts. IN 1989 WHEN THE GOVERNMENT TROOPS began raiding the Tumpusiong Valley; torching and looting homes, Noel Monoung, then a teenager, fled with his family to be with their relatives in Siae village, inland from the provincial capital of North Solomons, Arawa. They lived in Siae as ordinary villagers, concealing the fact that they were refugees from Panguna. For the young man, Siae village was freedom. He was everywhere doing whatever the locals did, but missing his home in Panguna which was the subject of PNG military frisking and destruction. Always he was eager for news from home. I'M WORKING ON A SERIES of studies concerned with the intellectual history of the 'informal economy', and its relevance to current concerns in Papua New Guinea. I hope, eventually, to 'join up' these studies in an extended monograph. The first study in the series dealt with Keith Hart's introduction of the idea of an urban informal economy and considered earlier writers who had described what may be seen (in retrospect) as informal economic activity. I contended they could be seen as precursors of Hart and his ideas. These writers were concerned with mid-Victorian London (Henry Mayhew), late-colonial British West Africa (Peter Bauer) and late-colonial PNG (Richard Salisbury). These precursor works opened the possibility of considering informality in market exchange across a broader compass than that of Hart, one embracing countryside as well as town. NAPOLEON BONAPARTE IS SAID to have galloped across a battlefield after one of his victories and, upon seeing a young enemy soldier dead with his arm across his chest and a peaceful look on his face, pointed at the body and said to his generals, "That is a good death." But in truth there is no 'good death'. Death is painful and sad and bitter and regretful. Maybe Dylan Thomas had it right. "Do not go gentle into that good night." Auntie Monica died at Port Moresby General Hospital yesterday. Auntie Monica was not famous, or particularly noteworthy in bikman terms. She was just a good ordinary PNG woman and mother who was bereft of proper health care in her last days after struggling hard for many years to eke out a living at the ATS settlement. THE AUSTRALIAN GOVERNOR-GENERAL, Ms Quentin Bryce, will arrive in Papua New Guinea on Monday for a four-day visit. Ms Bryce will mark Anzac Day on the Kokoda Track and undertake other engagements that recognise the historic defence links and highlight the strong bilateral relationship between both nations. The Governor-General will also focus on violence against women, the promotion of health initiatives to combat HIV/AIDS and tuberculosis, and the advancement of educational opportunities in Papua New Guinea. On Anzac Day, Thursday 25 April, Ms Bryce will honour the service and sacrifices of Australian Defence Force personnel in World War II at the Dawn Service at Bomana War Cemetery in Port Moresby. ONE ADVANTAGE OF WORKING for ambitious oil and gas explorers is you’re taken to some quite remote places, where the slow pace of change keeps time-worn traditions alive. In these places, you just might witness the tail-end of some weird and unpleasant practices and get a glimpse into an ugly world of old. After the latest four weeks on a job and a good time breathing real fresh air and observing gloriously unrivalled flora and fauna, my five-year term was up. The short helicopter ride to remote Wabo airstrip in the Gulf Province gave me another chance to observe the Purari from above. This river did a majestic job - painting its meandering path a murky brown. In this seemingly endless evergreen jungle, it made its way into the belly of the Coral Sea. THE AIM OF THIS ARTICLE is to look at the significance of Asia in this 21st century and survey how PNG, as an emerging economic power in Pacific region, should realign her foreign policy. This implies reorganising political, economic and strategic thoughts and resources to navigate through an uncertain environment with the strategic aim to gain the most optimal outcome. The Asia-Pacific region is dynamic and becoming the geo-political, geo-economic and geo-strategic heartland of academic debate. The rise of China followed by India has structurally shaped States’ foreign policy behaviour. Most analysts are questioning whether the current liberal order constructed by America would be replaced by rising China. If assumptions hold true, a ‘Sino-centric order’ with new rules of game, the ‘Beijing consensus’, will replace the ‘Washington consensus’. ONCE UPON A TIME there was a tiny eight square mile speck of land located in a most beautiful spot along the meridian of the equator in the vast and lonely reaches of the Pacific halfway between Hawaii and Australia. There was nothing really special about this place, it was nothing but a tiny coral atoll uplifted by previous tectonic forces, however the surrounding waters were teeming with fish, which attracted the attention of wandering birds. Offering protection from the dangers of the world, it became a favourite transit point for the wanderers of the sea, the frigate bird. For thousands of years this tiny speck of land remained unspoiled apart from the nomadic visitors leaving behind their tiny blobs of faeces as peppercorn rental. The only other immigrants were botanical, arriving on the sea and wind and finding the rich soils fertile enough to flourish abundantly. The postgraduate office printer is a battle zone. Here brave environomists* defend the rights of trees to grow a little bit taller. This is important in a society where people race to make every single dollar. I lived among those trees; my ancestors left them alone. HE WAS NOT SOMEONE you would notice right away. Just an average teenager doing average teenage things. You know - the one side of his jeans rolled up to the knee the other pulled down, a hint of facial hair that he takes so much pride in stroking every now and then, riding his bike in lazy loops up and down the street whilst engaging in hip Pidgin talk with his mates from across the street and getting his weekend rugby fixes all the while trying to get through high school. It was a Saturday morning and I was at home fiddling around when I heard rapid footsteps ascending to my flat. A short sharp knock and the door opened to reveal an emotional teenager. IN 1969, A GROUP OF JAPANESE academics from Kyoto City University visited the Sepik to conduct linguistic and anthropological studies in the area. They stayed a number of weeks in Angoram collecting artefacts and even some human skulls - a Sepik art form. The leader of the group was a professor of English and a veteran of the Japanese campaign in China during World War II – a charming and distinguished gentleman. There were two other young men, associate professors, and a beautiful young female anthropologist.